The impending silver tsunami raises many questions about who will take over the caregiver role the boomer generation has assumed. Though most headlines put baby boomers at war with millennials—criticizing work ethic, food trends, and residential choices—millennial children are largely the product of boomer parents. As their parents move into the senior population, millennials are becoming the family caregiver. In fact, of the over 40 million people in the U.S. who serve as unpaid caregivers for family members (most often a parent or grandparent), 10 million of these caregivers are millennials. Caregiving is a stressful and costly job. Where baby boomer and Gen X caregivers have the advantage of established careers and larger savings accounts, their millennial caregiver counterparts are just starting out. A whopping 73 percent of millennial caregivers work full-time jobs on top of their care duties, facing more pressure to balance their young careers and familial duties. In an AARP study, of the 1,200 millennial caregivers surveyed, the average reported spending on caregiving expenses per year was roughly $6,800 out of their own pocket, a higher portion than any other generation. Luckily, many companies, and even states, are instilling caregiving leave to help employees balance work requirements with care duties. Millennials are making progress in one area when it comes to caregiving: this generation’s men are almost equal to women in providing care. Of surveyed caregivers who have a loved one with Alzheimer’s or dementia, 53% are women, and 47% are men, where (as of now) the typical unpaid family caregiver is a 49-year-old female. One benefit to millennials providing care for their elder loved ones is the opportunity for intergenerational activity. As many reports have noted, we tend to stick to our peer groups rather than fostering relationships with younger and older generations, causing a greater gap between the generations. Time outside of their own peer groups provides millennials with different perspectives and new understanding of challenges others have faced. The U.S. is already seeing a caregiver shortage, and this is before most boomers have hit 65. What can you do to support these new, young caregivers? Millennial caregivers are often overlooked by national advocacy organizations, community support groups, and even in public policy. Like all caregivers, they’re at risk for social isolation. Without programs directed to their needs, they lack the comradery and support that older caregivers get from their cohorts. Creating a more inclusive conversation about caregiving can open opportunities for younger caregivers to find a supportive community. If you know a millennial caregiver, a simple visit could provide them with the socialization they’re needing and taking a moment with their parent or grandparent could be an appreciated break. 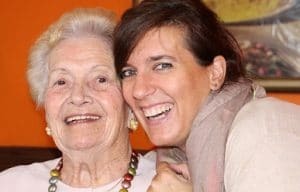 There are online memory care resources about Alzheimer’s/dementia symptoms and care that millennials can refer to, so they’re prepared to take on caregiving responsibilities when the time comes. Additionally, libraries, senior centers, and assisted living/memory care communities (such as Aegis Living) host guest speakers who are experts in the Alzheimer’s/dementia field. Many of these are completely free to attend and offer valuable information. Show your support by offering to accompany them. Aegis Living is lucky to have dedicated millennials working in our communities. With the number of individuals over the age of 65 set to double in the next few years, the senior living industry needs wonderful caregivers, nurses, activity directors and more. If you know someone interested in a meaningful, rewarding career, please visit our careers page to view open positions.